A strong-willed Southern woman living her dream life in Paris, Lexie Miles is devastated when her best friend Emma is brutally murdered by vampires. From that moment her “dream life” begins to crumble. She discovers that not only was Emma living a double life, but her boss Tom Grant is as well. She is plunged into a 500 year old secret that takes her on an unimaginable path. When her mother, Cassie, comes to Paris for her thirtieth birthday, Lexie is bequeathed with a birthright that gives her super being abilities and the dubious gift of being the “Chosen One”. Her entire life has been a lie, and she is pissed. Meeting Etienne Benoit, head of a secret society, she is inexplicably drawn to him, and she ignites in him a sizzling desire that refuses to be ignored. Etienne reveals his story and Emma’s link to the Society and her brilliant perfection of two antiserums. Lexie must come to terms with the concept that she may be falling in love with a vampire. She reluctantly accepts her legacy and along with Tom and Etienne travels to the headquarters of the Society in Southern France. They receive an e-mail from Emma that reveals the first clue in what proves to be a race against time and the dark forces that threaten to destroy everything Etienne has created. A traitor lurks among them and they have no idea who it is. As war rages across the land Lexie, Etienne and Tom hunt frantically to find the antiserum that Emma hid before she was murdered. Lexie’s kidnapping and Tom’s death at the hands of Etienne’s son Francois and his partner Marielle spurs Etienne to take drastic action. The result leaves Lexie alone and despairing that she will never see her love again. Unwilling to accept this fate, she enlists the help of Kendrick McDonough, a Scotsman and Etienne’s second in command. Kendrick becomes her friend, trainer and mentor. Lexie vows she will never give up on Etienne. She will find a way to return him to the light side. Ellen lives in Vancouver, British Columbia and finds the months of rain and gloom particularly conducive to creating in this genre. Ellen’s love for reading and writing developed at an early age and she wrote several short stories and plays which were lost over the years and many moves. Ellen’s passion for travel began when her Dad took a position with an international soft drink company and they moved to Bogota, Colombia. While in South America Ellen and her family lived in most of the major cities, including, Caracas, Venezuela, La Paz, Bolivia, Lima, Peru, Santiago, Chile, Buenos Aires, ArgentinA and Rio de Janeiro, Brazil. Ellen spent her high school years near Chicago and in the summer between high school and university moved to Atlanta, Georgia where she lived for the next thirty years. In 1996 Ellen moved to Vancouver where she met and married the man of her dreams. While they were married, her husband, a French Canadian, introduced her to the French culture and in particular Southern France and for the first time in her life, Ellen felt like she’d come home. Ellen was first introduced to vampires through Anne Rice’s Interview With A Vampire, and although she fell in love with the book, vampires were not in the forefront of her reading must-haves. Then in 2003, a friend introduced her to Buffy the Vampire Slayer, and Ellen was fascinated by the idea of good and evil vampires. At that point she started reading every vampire novel she could find, particularly loving Anne Rice, Charlaine Harris, JR Ward and Laurell K. Hamilton. 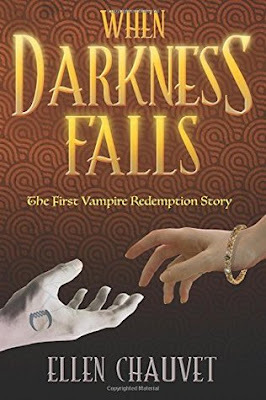 When Darkness Falls is the first in a series of books called The Vampire Redemption Series and is adult fiction.